There is one man in the film industry who is in himself a brand for excellence and who rarely disappoints his audience who rightly expect sparks, be it at the ticket counter or in terms of aesthetic quality. No prize for guessing? Mr. Perfectionist, Aamir Khan. He simply takes Dangal to another level, playing Mahavir Singh Phogat that will set the bar to a soaring high in the display of such a mature character, wearing shades of ruthlessness as a father and expressing the pain conveyed in his eyes. It’s a fab act. A film like Dangal on sports and real life personalities will serve as a strong reference point in years to come through the helming of a terrific script, brilliant execution by Nitesh Tiwari and the entire cast excelling. Dangal traces the story of Mahavir Singh Phogat, the journey and rise of his daughters, Babita and Geeta whom he helped trained to win big in wrestling. It’s not easy to make a film on sports and depicting real life characters but it is where Dangal scores high, beautifully blending fiction, entertainment, and fact. A master story-telling of faction. Aamir Khan leads the ensemble cast and carries the film on his shoulders from start-to-finish playing the wrestler who couldn’t make it big but see the dreams in his daughters. The actor’s body language is terrific and effortless emote, without going over the top which is one of the core strength of the film. The best thing is Aamir evades the pit of not letting his real-life persona tower above the script and watch Dangal to know what I mean. It constitutes the beauty of this film. Moreover, his transformation in the movie and gaining weight is beautifully sketched and presented on screen. Sakshi Tanwar competently matches Khan and her body language is simply fantastic and conveys the multitude emotions in a restrained manner. Debutant Fatima Sheikh impresses as Gita and she is at her natural best, playing the character. She is excellent in her first film and will fetch awards along with her reel sister Sanya Malhotra. Both actors share an explosive chemistry. Their younger selves in the movie, Zaira Wasim, and Suhani Bhatnagar are not only excellent but also endearing and relatable. Ritwik Sahore who plays the younger version of Aamir’s nephew is first-rate and endearing, while Aparshakti Khurrana (the elder version) performs competently. The coach role played by Girish Kulkarni is a perfect fit for the role, high on ego, arrogance, and scheming. The film has several poignant and stand-out scenes where the child bride reminds the Phogat sisters on how Mahavir Singh Phogat is a father every girl deserve for believing in women who are married off and treated as a burden in the village of Haryana. The scene is executed in a subtle manner, touching the plight of woman in our society where dreaming big is perhaps not allowed. 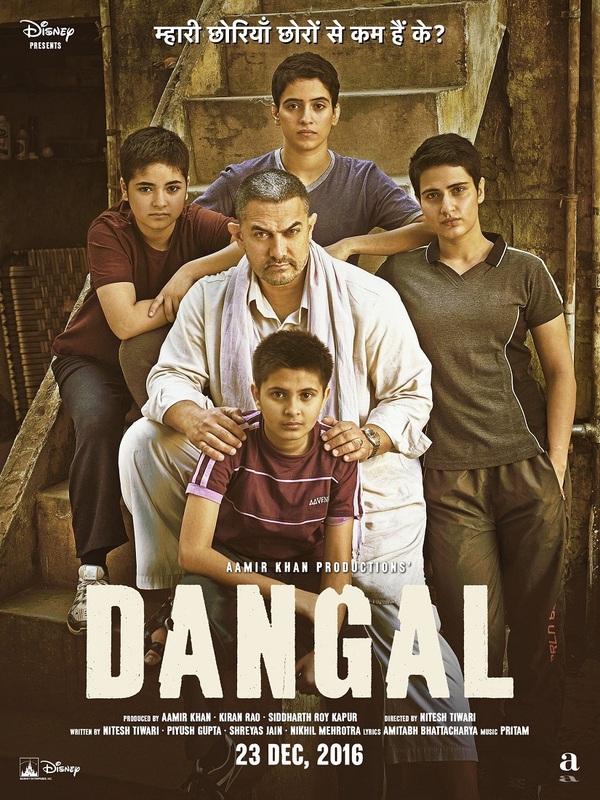 The scene where Aamir Khan pleads in front of the board for his daughters to stay in the institute or Geeta wrestling with the father is executed in an unblemished manner. The devil lies in the detail and the wrestling scenes are shot and captured with sheer cinematic brilliance. On the other hand, the filmmaker has taken creative liberties and it shows in the scene where Aamir Khan is locked inside the room seems to be out of place and done with the aim of pouring masala. It goes against the whole spirit of the film and is one of the minor setbacks in the film. The editing is cutting-edge, outstanding screenplay and the direction by Neeraj Tiwari is a stroke play that engages the audience through a seamless blend of emotions, sports, vanity, gently touching women conditions and patriotism. Aamir Khan act is the real icing in a film that not only entertains but bring to the fore the story of two of the most brilliant women athletes and the sacrifice of their father. The actor is stupendous in delivering the Haryanvi accent to near perfection. Dangal will be remembered as one of the biggest masterpieces in recent times and the movie will be counted among Hindi cinema’s golden era. PS: I am taking a blogging break for the New Year and see you in another week. Keep reading and commenting.